Visiting Bali? Decided to stay in Seminyak? 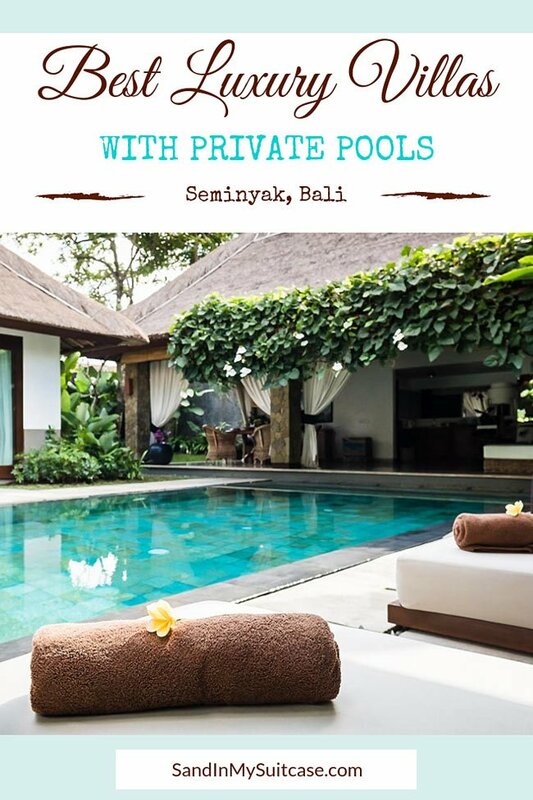 Now you want to know about the best villas in Seminyak with private pool, right? 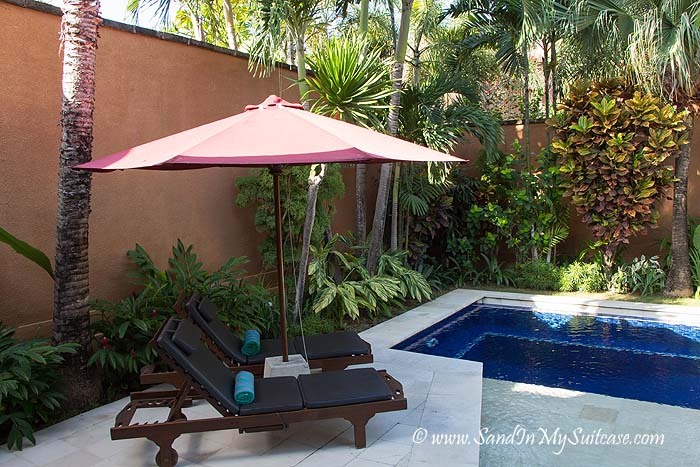 Villas in Seminyak with private pool – Better than a luxury Seminyak hotel! 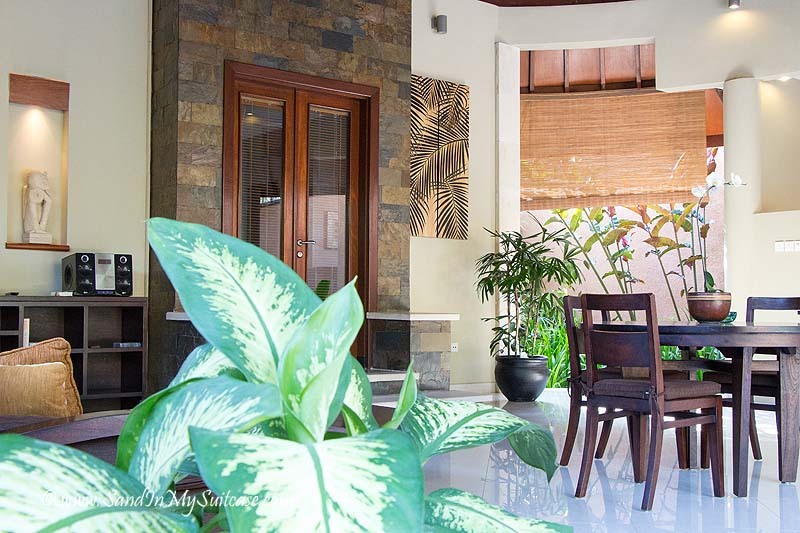 What to know about these villa rentals in Seminyak – Rates, what’s included, chauffeur service, etc. 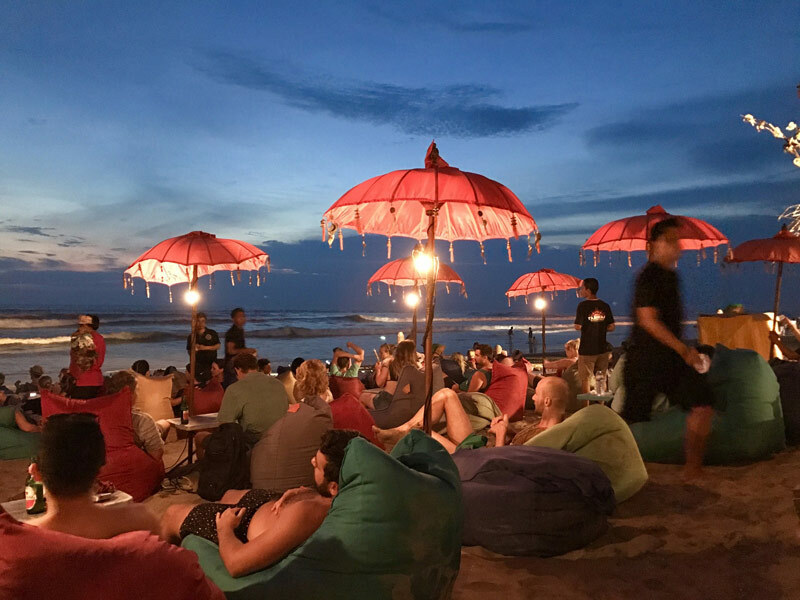 For those not in the know, Seminyak – once a small village – is now Bali’s trendiest and most fashionable district. The club scene buzzes (the strangely-named Potato Head Beach Club is one of the most happening). The restaurants rival those anywhere in the world (we chowed down on some of the best Italian pizzas outside of Italy). 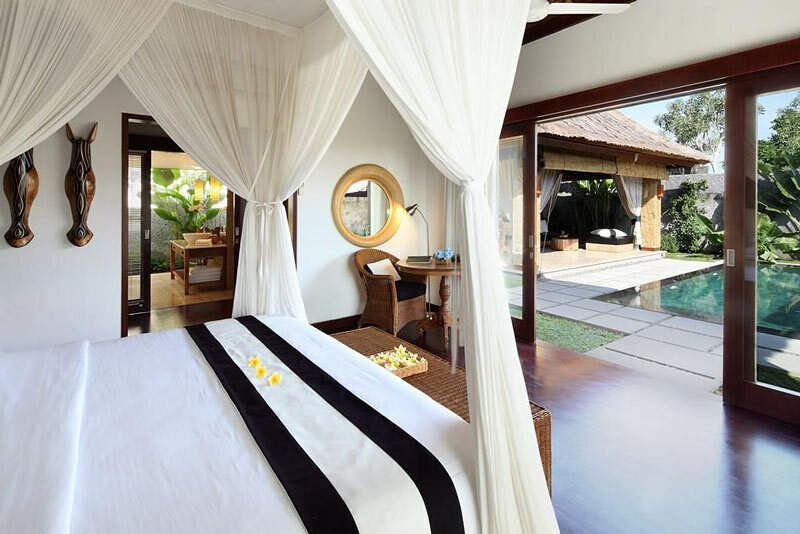 You could stay in one of the luxury hotels in Seminyak. Hipsters like the W Retreat & Spa Bali. The deluxe Alila Seminyak has a great beach bar and no less than five pools. But many visitors prefer to opt for villas for rent in Seminyak, complete with maid service, swimming pool and a kitchen. The price is often less than a boutique or luxury hotel. And you get more privacy and space to spread out. Now, if you’re regular readers of our blog, you know we’re not immune to the delights of being pampered at luxury hotels. See our reviews of a dozen luxury Bali hotels – choose the right one for you! Sometimes, though, it’s nice to have access to a kitchen – and to kind-of feel like you’re living at home while you’re away traveling. Enter the skilfully run Kunja Villas & Spa and The One Boutique Villas. These two villa properties offer the best of both worlds. 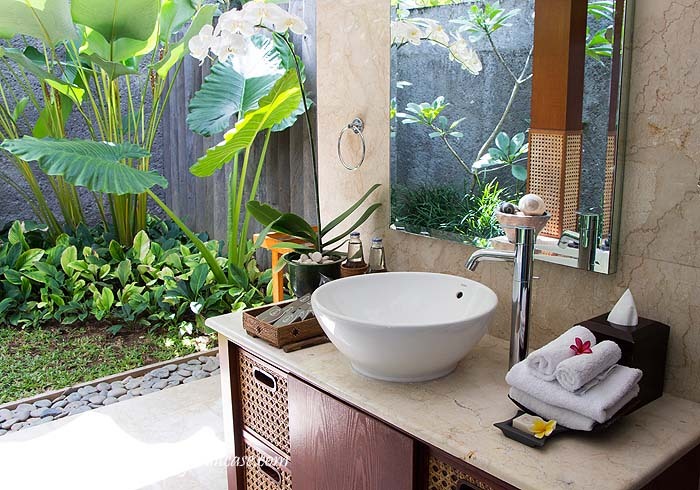 They tick off our requirements for luxury Bali villas in Seminyak, with the added benefit of hotel-like services. Contemporary in design, Kunja Villa (or Kunja Villas & Spa) has 14 one-bedroom and four three-bedroom villas. In our one-bedroom holiday home, the air-conditioned, all-white marble bedroom opened onto a breezy open-air living area (visited sometimes by tiny geckos). 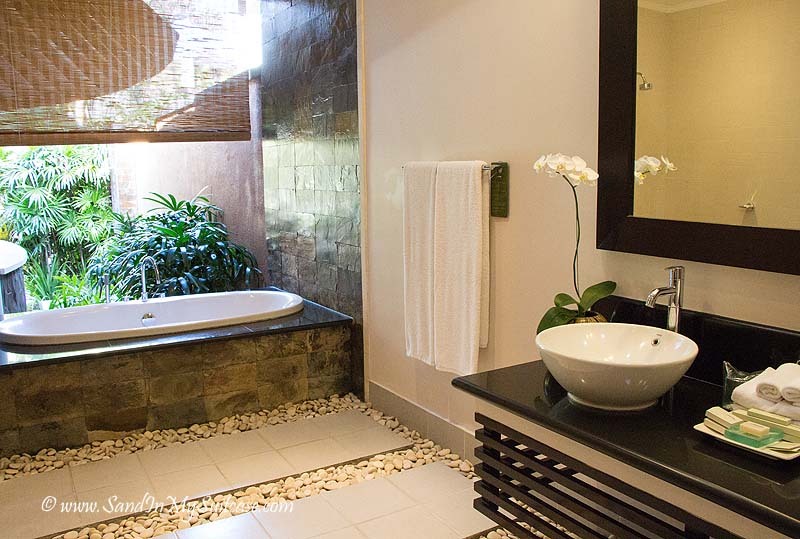 Decorated with a single white orchid, the minimalist bathroom was beachy in feel with white pebbles scattered around stone slabs on the floor. The small swimming pool had a shallow side beside the deck for sunning while lying in the water. 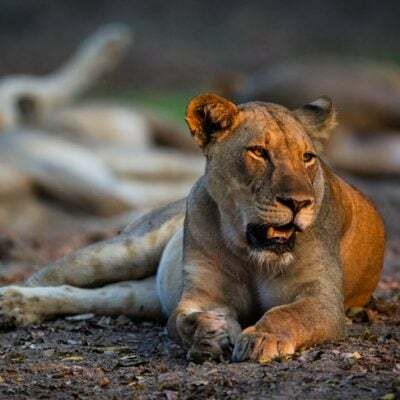 We’re not the only ones who loved our stay at the Kunja Villas. Of all hotels in Seminyak, it consistently rates #1 (or close to it) on TripAdvisor. Book The Kunja here on Booking.com! Kunja was great, but we personally preferred The One Villas (also known as The One Boutique Villas). This property has six villas. More Balinese and traditional in style, these one-bedroom villas to rent in Seminyak have thatched roofs, separate sleeping and living pavilions, and lush gardens surrounding the pools (we always heard birds chirping). Our villa felt more tropical than our Kunja villa, and somehow more intimate and homey. The bedroom had polished wood floors and black-and-white, 1930s photos of Balinese girls adorning the walls. There were no walls on two sides of the bathroom – which looked out over fern gardens and shady palms. 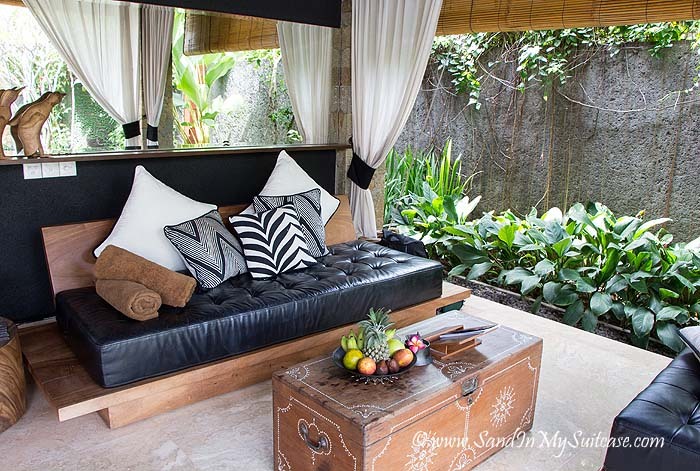 The One Boutique Villa also rates tops on TripAdvisor for where to stay in Seminyak (usually #2). 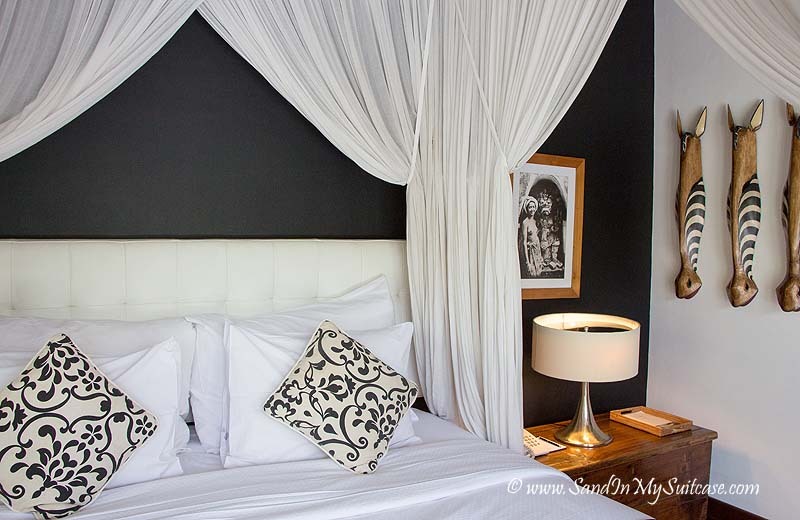 Book The One Boutique Villa here on Booking.com! For honeymooners, couples and families who want a quiet, serene and private retreat in the heart of lively Seminyak, these properties are two of the best Seminyak villas (and best non-hotel villas in Bali too)! 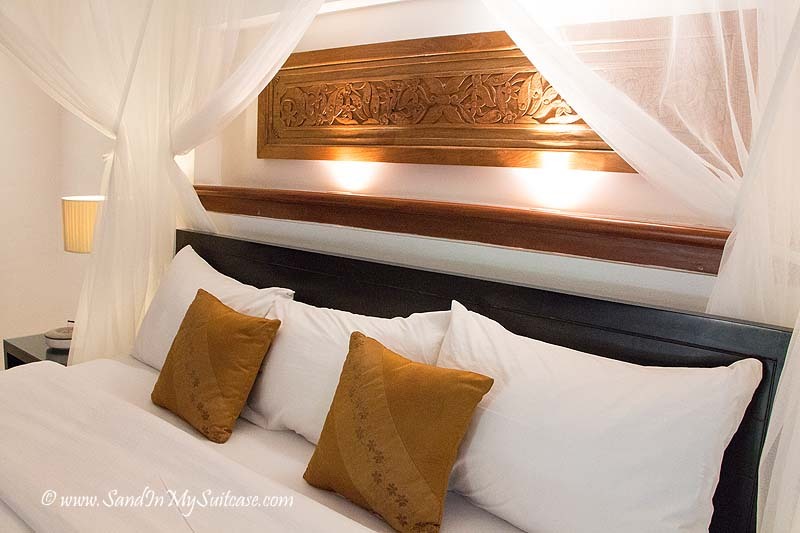 At both Kunja Villa and The One Boutique Villas, rates include breakfast and afternoon tea, chauffeur service on demand to nearby restaurants and clubs, airport transfers and fast free WiFi. A maid carrying a wicker basket of supplies comes to your villa to cook your eggs and slice fresh fruit for your breakfast. Later in the day, a phone call is all that’s needed to get afternoon tea and cookies delivered. You get chauffeured to nearby beach clubs and Seminyak’s bars and restaurants whenever you want. This is a very welcome perk, as the traffic makes it difficult to safely walk around in Seminyak (especially at night) – there are few sidewalks, and you constantly have to watch out for motorbikes and cars which, albeit slow-moving, threaten to bump into you if you’re not careful. Don’t worry about fussing with taxis. Return airport transfers are included in your villa rental. You’re given iced facecloths, water and chilled fruit to nibble on the drive. Like this review? Then pin to your Bali or Asia Pinterest board! 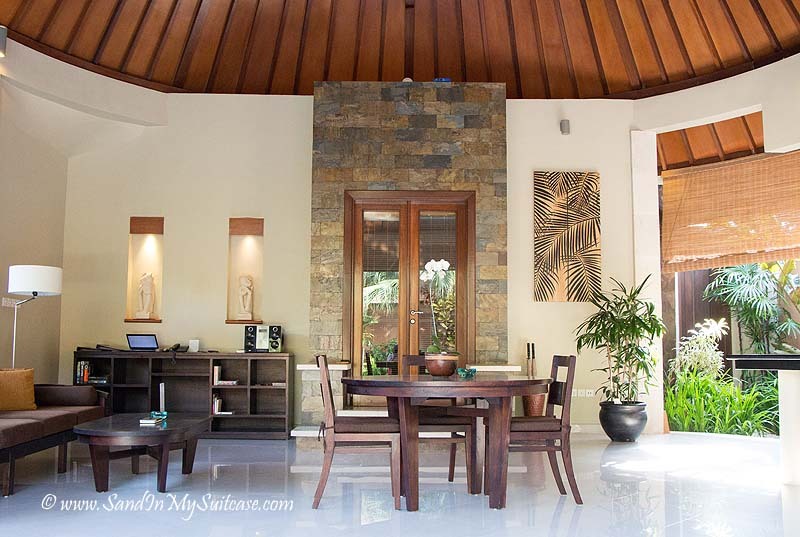 We were hosted as media guests at these villas in Bali for review purposes. But the opinions expressed here are ours, and we’re always free to write what we think. What’s your travel style? Do you like staying in hotels or villas and apartments? Oh man! Very beautifully written. Also, the place was so beautiful! Went there with my gang for a small getaway which turned out to be the most memorable of all. 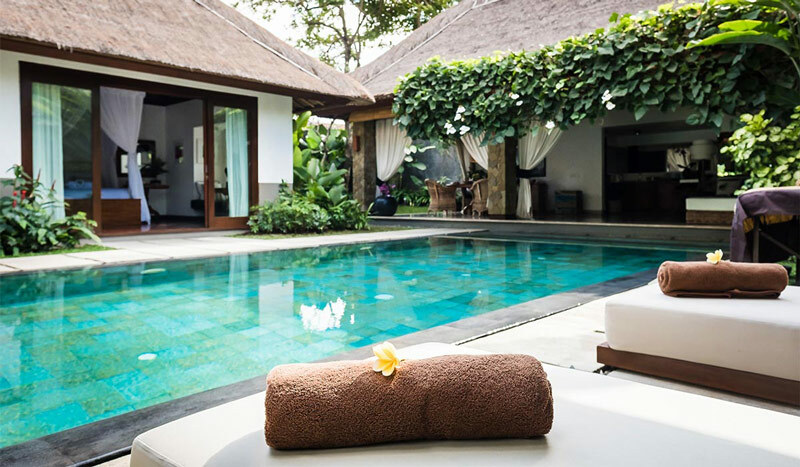 We all stayed in a very beautiful villa in seminyak – Villa Bugis – which had a private pool and personal staff. The place itself stands out of the crowd. Glad you enjoyed your villa stay in Seminyak :-). All the villas are beautiful! You should also include Hu’U Villas. it’s the best villa I can recommend. Stayed there with family and friends and it was awesome! I would also recommend checking out Bali Villas and More. They offer great accommodation that can fit any budget. I always book with them for my Bali holiday! Hi LV, Thanks for letting us know :-). Good thing villa rentals with hotel-like service are now available. And, it’s not just the service that can be matched, amenities, privacy and price are something to be considered as well. The thought of having a grand time with your loved ones without being disrupted by others is divine. I truly love the idea of privacy especially on the limited time you have during your holiday break. Seminyak sounds very trendy and very expensive. I think if I were spending that kind of money I wouldn’t need a kitchen. I book a place with a kitchen if I’m trying to keep to a budget, so cooking some meals helps do that. Otherwise, I like restaurants: the variety and the feeling of going out and being among other people. Although, if my budget allowed it, it would be wonderful if the kitchen came with a cook! Yes, we hear you about the cook! Villa rentals are great because you aren’t confined to a room and forced to meet all your meals in public places. It’s especially great when traveling with friends or family because you can all be under the same roof! This looks like an absolutely beautiful property with a truly heavenly bed! Agreed! We find it’s nice to have the extra space you get when you stay in a villa. 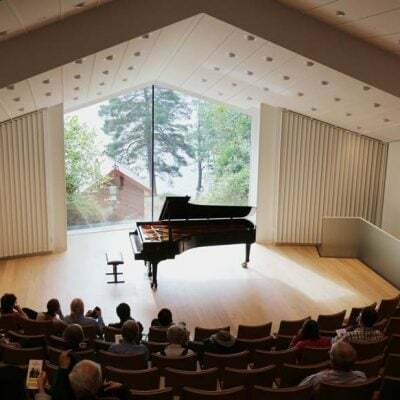 And they’re often no more expensive (sometimes less expensive) than staying in a hotel – and certainly less expensive p.p. if you have a large villa shared between couples. Thanks guys for this lovely post. Hope to visit Bali one day. And that bed looks awesome. Looks like the area has moved upscale since I was there years ago. Then it was full of wholesale clothing shops where boutique buyers from all over the world came to buy the goods for their stores. Is it still like that? Even back then it was much more laidback than Kuta. No, Seminyak is very upscale now. Lots of high-end boutique shops, restaurants and nightclubs. And we wouldn’t say it’s laidback! It’s actually very busy – all developed. 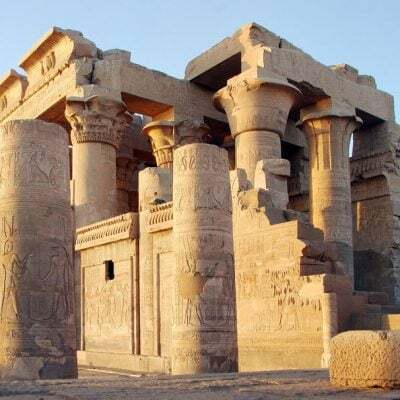 (In your walled villa, you escape the hustle and bustle outside and don’t hear any noise.) But Seminyak is still less busy than Kuta, and definitely more smart. Say hello to the world’s best river cruises and river cruise lines!